The treacherous waters of the Golden Gate have claimed dozens of ships and hundreds of lives. Beginning in 1852, the United States Government funded the construction of a chain of 59 light-houses along the California coast. 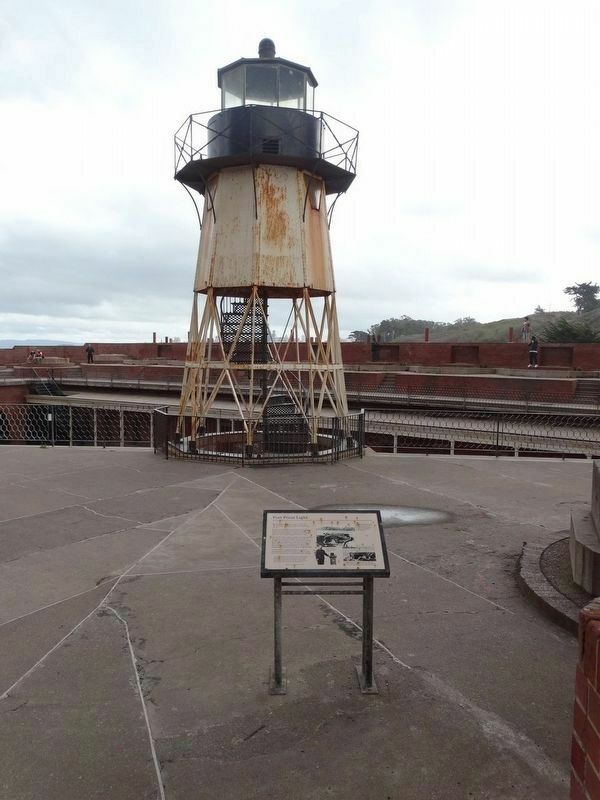 The Fort Point light was one of 13 servicing San Francisco Bay. The first Fort Point light was built and destroyed in 1853. Army engineers blasted away the bluff on which it stood to allow for the construction of Fort Point. A second lighthouse, built near the water in 1855, was removed to permit seawall construction. 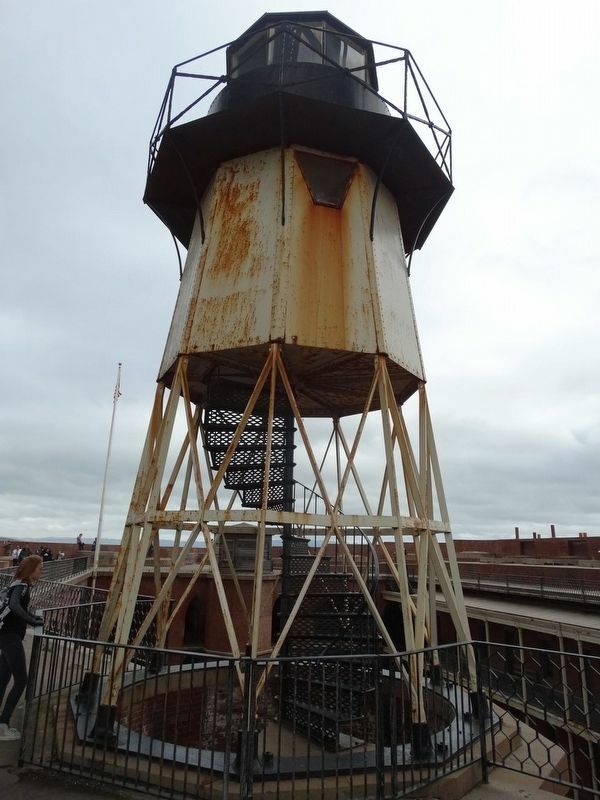 Brevet Lieutenant Colonel Robert S. Williamson, designed this third Fort Point light, finished in 1864. 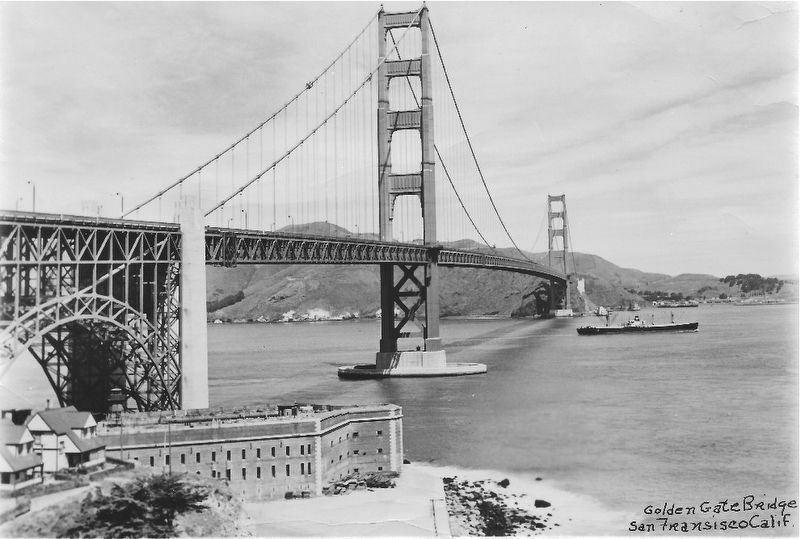 In 1934, the U.S. Lighthouse Services keepers extinguished the Fort Point light for the last time due to the construction of the Golden Gate Bridge. "There is nothing here to see. There is the ocean and the sand and the guns and the soldiers. That is all. It grows monotonous. Always the ocean and the sand and the guns and the soldiers. As for the ships, one grows tired of them too. I have my family and my pleasures." Erected by Fort Point National Historic Site Serivices. Location. 37° 48.635′ N, 122° 28.626′ W. Marker is in San Francisco, California, in San Francisco City and County. Marker can be reached from Marine Drive. Touch for map. 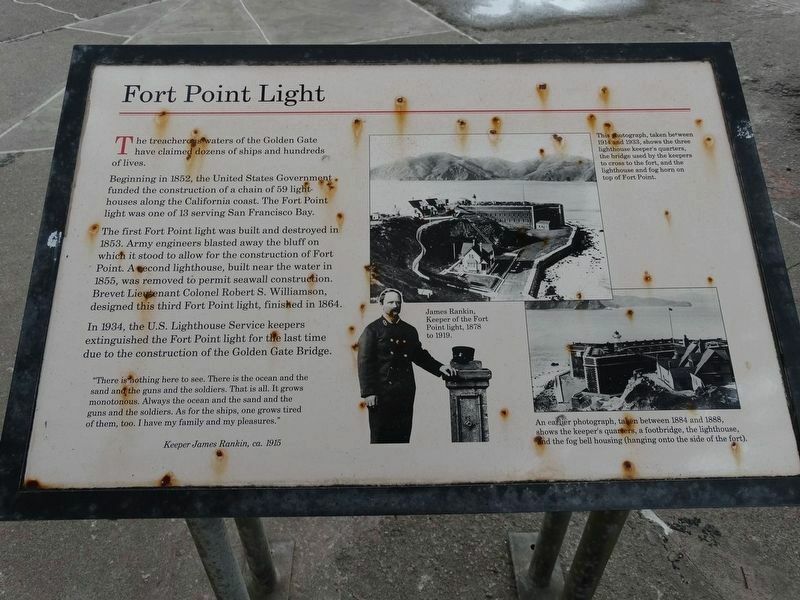 The marker is located at the Fort Point National Historic Site. Marker is in this post office area: San Francisco CA 94123, United States of America. Touch for directions. Other nearby markers. At least 8 other markers are within walking distance of this marker. Defending the Golden Gate (here, next to this marker); a different marker also named Defending the Golden Gate (here, next to this marker); Fort Point National Historic Site (within shouting distance of this marker); Castillo de San Joaquin (within shouting distance of this marker); Fort Point (about 400 feet away, measured in a direct line); The Golden Gate Bridge: Vision, Genius and Expert Care (approx. 0.2 miles away); Men of Vision (approx. 0.2 miles away); The Era of Earthworks Batteries (approx. ¼ mile away). Touch for a list and map of all markers in San Francisco. 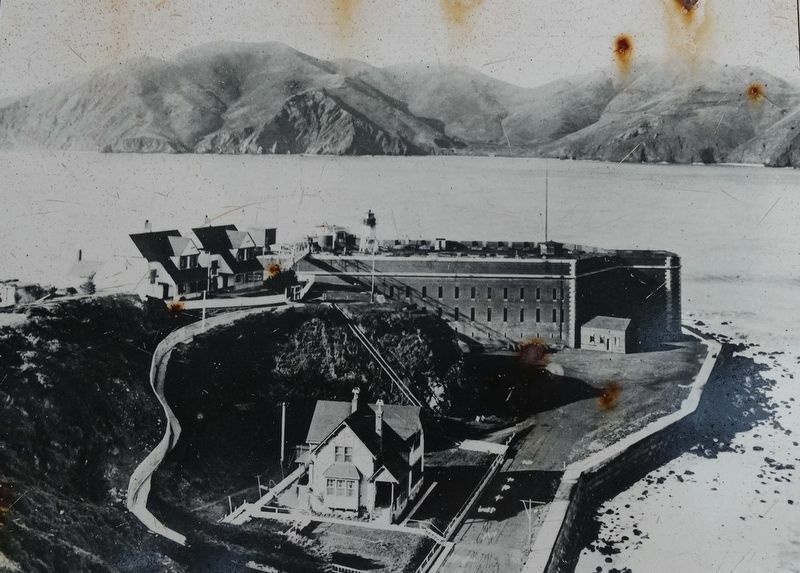 The photograph, taken between 1914 and 1933, shows the three lighthouse keeper's quarters, the bridge used by the keepers to cross to the fort, and the lighthouse and fog horn on top of Fort Point. 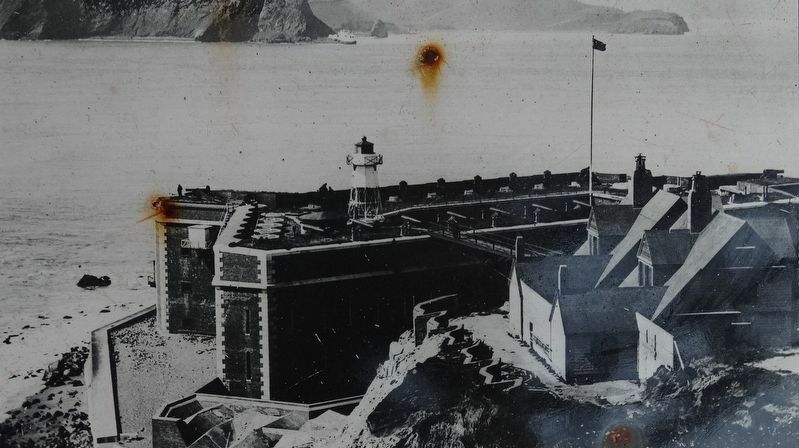 An earlier photograph, taken between 1884 and 1888 shows the the keeper's quarters, a footbridge, the lighthouse, and the fog bell housing (hanging onto the side of the fort). 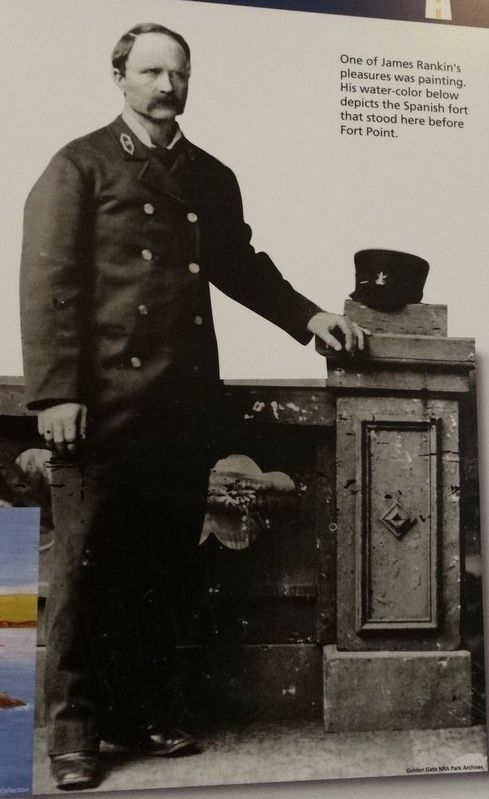 James Rankin, Keeper of the Fort Point light, 1878 to 1919. The photo shows the light-houses to the left that were still there after the bridge was built. The photo belonged to my father. More. Search the internet for Fort Point Light. Credits. This page was last revised on April 14, 2019. This page originally submitted on March 26, 2017, by Denise Boose of Tehachapi, California. This page has been viewed 83 times since then and 12 times this year. Photos: 1, 2, 3, 4, 5, 6. submitted on March 26, 2017, by Denise Boose of Tehachapi, California. 7. submitted on April 13, 2019, by Denise Boose of Tehachapi, California. • Syd Whittle was the editor who published this page.